A Letter From Jack White to the Media: "i can't even make kool aid"
Poor Jack White just can't catch a break with the media, it seems: first, his tour rider was leaked by the University of Oklahoma's student newspaper, where it was revealed he likes a very specific type of guacamole, among other delicacies; then, NPR took a gentle ribbing to the rider, where an acclaimed chef weighed in and rated White's guacamole recipe as "biting into little explosions of flavor," followed by sharing the recipe on its website. It was all too much for our former White Stripes frontman, though, who, through his publicist, released an "open letter to the media," subject line: "FOR GOD'S SAKE! ", decrying the whole leak as a bunch of "click bait hoo haa." even in the age of the short attention span internet article, it's still hard to believe you are STILL writing about this. seems like there's a new rule number one for up and coming journalists: don't let the facts get in the way of click bait. at the risk of incurring even more of this hoo haa (and i've definitely turned my cheek more than once lately) and even though our management sent out a letter to clarify this, and since this seems to be all anyone can ask me about lately, here's the real deal, and hopefully it'll explain this nonsensical scenario and we can move on with our lives. (or what have you). first off, this is none of your business, but i have no specific demands in my dressing room. i know i could ask for lots of things but i actually don't ask for ANYTHING. i take with me what i need, and that ain't much. anything on the rider is for the band and the crew. this "guacamole recipe" is my hilarious tour managers inside joke with the local promoters, it's his recipe, not mine. it's just something to break up the boredom, seeing who can make it best. though i wouldn't know because i've never had it. i can't even make kool aid let alone cook any real food enough to have a "recipe." sorry, i don't have that talent. Interpretation: Sorry you're so basic that your recipes don't serve inside jokes, only food. bananas: did it occur to anyone someone on the tour might have an allergy to them? no? hmmm. one day some fantasy journalist out there will call someone in the biz and actually have a rider explained to them, maybe none of them have ever been on tour. Yeah, leave it up to journalists to pull the old, "I'm just a journalist so I can't go on tour with you, not-Rihanna Jack White" schtick. oh well, let's move on, first amendment issues: i fully believe in the freedom of the press (though the supposed search for truth from the press requires microscopes and a some morton salt), and i also defend anyone's right to free speech (just look at my lack of respect for grammar in this letter and tell me i'm not for communicating freely) and i defend the right to free information in regards to public funds, but never in my 20 years of playing shows has my contract and tour rider been published in the paper that i recall. Morton's, eh? I took him for a Himalayan pink sea salt kind of guy. Moving on. do you know why we don't do that or want that? a hundred articles about bananas, free speech, and guacamole is why; it's because people don't understand what a rider is or what the terms of a contract are. they're out of their element, and you can't blame them for it. and people who write about that know this. people WANT a rider to be a list of demands that a diva insists occur lest he or she refuse to play a note of music. You got that? People demand riders. They insist. but in reality, it's just some food and drinks backstage for the hundred workers and guests who have to live in a concrete bunker for 15 hours. some people bring their own living rooms on tour, some people ask for a huge spread. who cares? what you're looking for is someone throwing a tantrum because they didn't get their brown m and m's, sorry to disappoint. He is SO not throwing a tantrum, you guys. someone printed that i'm never going to oklahoma again? not true. i love oklahoma, that's why i booked this show instead of playing chicago or atlanta for four times as much money. ask around in tulsa. i've been there at least three times on these last two albums. i love it there. Ask anyone. Like your second cousin on your dad's side, Charlotte, who you met once at a wedding when you were like, 7, who maybe still lives in Tulsa but I don't know, maybe she moved to Boise or something. our booking agent warned the college that other artists might not book shows there? of course they did, it's bad business what that school paper did and really rude. of course they are going to tell them to wise up. am i pissed at the students at oklahoma university? absolutely not. am i disappointed in young journalists at their school paper? absolutely. but i forgive them, they're young and have learned their lesson about truth and ethics hopefully. all they have to do is google this to know that it's not worth it. He's not pissed; he just wanted to let everyone know that someone on tour may or may not have a banana allergy, but because they live in a bunker for 15 hours a day, he won't be able to get a timely answer for you on whether that allergy actually exists, sorry to say. Maybe Google knows, though? i got pissed during my show and berated the crowd? no. sorry, didn't happen. i made jokes about the paper publishing that info, so which of us is thin skinned? they have freedom of speech but i don't? at my show? ok. i guess the rules change for different people. the crowd were amazing and we played for 2 and a half hours that night. people were told to delete photos on their camera? i dont know much about that but it must be a miscommunication about what was public property at the college and the contract we had with the university to let us do our work in peace; but i'll give you an example, if someone working at a theater we played at started taking pictures of all of our workers and our gear they'd probably get fired by their theater or promoter. sorry to the student paper budding press papparazzi on that one, but is this a tmz assignment or can you give us some peace while we try to put on a show for the students? give us a break man. Things that aren't thin-skinned: bananas; avocados. i know it's a fun thing for people to try to turn me into a jerk and a diva, but in this case it's pretty ridiculous and has almost nothing to do with me. my relationship with the fans at that show and how we got to a new place together through music remains intact and i'd love to do it again with them. He'd love to play University of Oklahoma again, just not *at* the University of Oklahoma. i think that's everything, can i go back to making music now? 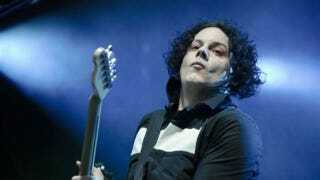 Of course, Jack White! You can do anything you want. no? ok. crochet it is.